Four-day/three-night tour in Northwoods and Lake Superior in Wisconsin. continues to enjoy a revitalization of its downtown and historic and cultural neighborhoods. The arts are celebrated with a music festival, and plans for a new performing arts center are in the works. Head north to Cabin Ridge Rides in Cadott! Draft horses take your group through a wooded trail. Enjoy a meal and entertainment in a gaslight cabin on this century-old farm. Get your creative juices going at the Potter’s Shed –like nowhere else! Create your own wood sign from hundreds of designs or using your own idea. Make it and take it or choose pre-fired bisqueware and glaze to decorate your pottery back home. While waiting for the glazing and cooling, enjoy the Shed Café with its rustic décor and home-cooked meals. Now continue on Highway 29 to Wausau and then head north on Highway 51 to the beautiful Minocqua area. Enjoy touring a factory, take a thrill on a zip-line canopy and kick back at a brew pub and distillery. Explore nature at a wildlife center or interactive zoo, and don’t forget to make time for the service station memorabilia museum, a winery tour and an easy-walking downtown shopping district. End your evening at a lumberjack dinner for a fabulous all-you-can-eat, family-style meal. Head north to Hurley on the border of Wisconsin and Michigan’s Upper Peninsula. Known as a wild outpost back in the days of the region’s iron mining, it is visited today for the glorious waterfalls on the Montreal River. The city’s 19th century courthouse, listed on the National Register of Historic Places, is a museum devoted to the area’s rich mining, logging and farming heritage. From there, you’ll travel west to the Bayfield area. Take in a show at the Lake Superior Big Top Chautauqua – a blue canvas tent with breathtaking acoustics featuring local and national talent. Then hop aboard the Madeline Island Ferry, which sails between Bayfield and Madeline Island, the largest island of the Apostle Islands. After a 25-minute voyage, your group can take a walking tour in the town of La Pointe or travel by coach with a step-on guide to learn about the island’s history and culture. 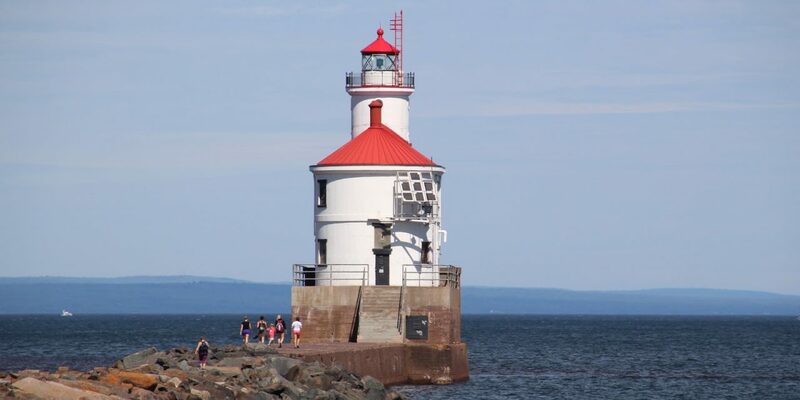 Take the scenic route on Highway 13 to Superior-Douglas County, nestled on the western tip of Lake Superior. Whatever your level of adventure, you’ll find it here from trails to museums to arts & entertainment. Home to many local artists, this area welcomes you to its studios to enjoy potters, painters, photographers and textile artists. 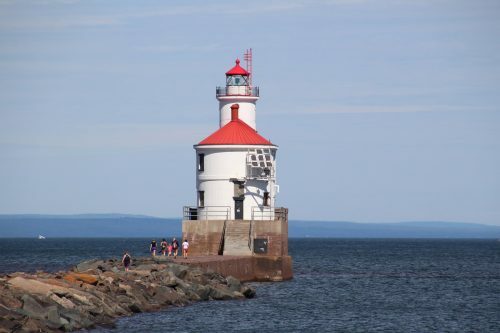 Take in the Superior Entry Lighthouse, tour a historic mansion, firehouse, police museum and whaleback ship. Make a stop at Amnicon Falls State Park and Pattison State Park – featuring Wisconsin’s highest waterfalls.